I just finished watching an incredible message for women on GodTV (watch it free on demand here) from Roberts Liardon. In this message, Liardon basically just told stories about three powerful Kingdom women of generations past: Mother Etter, Aimee Semple McPherson, and Kathryn Kuhlman. He told about their humanness, their frailty, and their failings; but above all, he told about how they chased the vision God had given them and how God used them mightily. This is a perfect example of how to receive anointings from past generations. Dr. Liardon has studied great heroes and heroines of faith extensively. He has spent massive time and effort studying into about what made these people great in the Kingdom. He has honored them by telling their stories and proclaiming what God did in their lives, and how He used them, to current generations. And during the course of all that, God rewarded him. He dug into old wells of revival, and God let him drink from the water since he took the time to dig it up. You and I can receive anointings from past generations the same way. Who’s your hero? What did they have that you want? Maybe it was someone in your family, like a godly parent or grandparent. Maybe it was a businessperson. Maybe, like me, you admire the great revivalists of yesteryear, such as Jonathan Edwards and Charles Finney. 1. Study what made them great. Charles Finney was a man of prayer. When I learned that, I began to understand that if I want to demonstrate in my life what Finney demonstrated in his, I need to pray like Finney prayed. Jonathan Edwards was a man of great self-discipline. If I want to accomplish as much as he accomplished, I need to make the most of my time and take my calling seriously. A.W. Tozer was a man who cherished the Holy Spirit. If I want what Tozer had, I need to learn to love the Holy Spirit too. Roberts Liardon was honoring Mother Etter, Aimee Semple McPherson, and Kathryn Kuhlman by telling their stories. He also honored them when he studied their lives. And because he honored them, God has placed a deposit into his life of what they had. It’s as plain as the nose on your face when you see Liardon preach. Studying the way they lived their lives. Talk about your hero’s ministry. Honor what they did for the Kingdom. When you honor a prophet or righteous person, God will give you a deposit from that person’s life. 3. Sow something into your hero’s life or ministry. If your hero is deceased, you might visit their grave and ask God for what they had. Find a descendant of theirs and bless the descendant. Partner with their ministry financially if they are still alive. Travel to hear your hero preach if they are still alive… even if you have to sacrifice to do so! Shortly after I was saved in 2001, I began listening to Joyce Meyer. Her teaching made all the difference in the world to me. When I saw that she was going to speak at a conference nearby, I determined to go. Making that trip was a sacrifice. It was a 6-hour drive one way; my car broke down on the way and had to be towed and worked on; I took my own cereal and hot dogs and ate from my cooler the whole time because I didn’t have money to eat out. But you know what? God honored that sacrifice. He filled me with the Holy Spirit at that conference. And I’ve never been the same. God blessed me because I sowed time, effort, money, and sacrifice into going to hear Joyce Meyer… which demonstrated my hunger for God Himself. Another example: God changed my life when I traveled to Finney’s grave in Oberlin, Ohio a few years ago. While there, I laid on his grave and asked God to give me whatever Finney had that God wants me to have too. My life changed that day and has never been the same. I believe God gave me something there because I honored Finney enough to study his life, visit his grave, and ask for what he had. If you want what someone else has or had, sow something sacrificial into that person or that person’s legacy. So that’s it. Study what made your heroes great, and emulate what they did. Honor them. Sow your money, effort, and actions into their ministries. If you will, God has promised to reward you for it. Who is your hero? 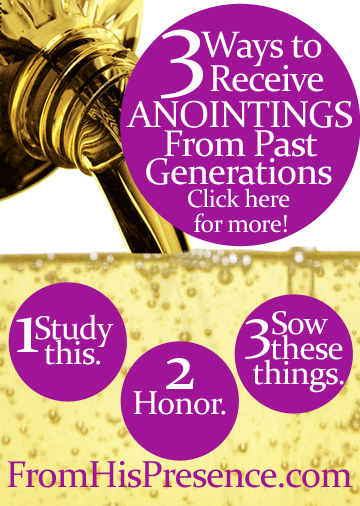 What can you do today that will help you receive their anointing? Leave a comment below! Image courtesy of the United Soybean Board on Flickr. Oh Jamie, you are so right on and have confirmed what’s been on my heart. Recently I’ve been thinking about and cherishing past generations of writers/authors I have read and also leaders in the church I grew up that have meant so much to me. These influences were an important foundation in my life and I thank God for them! Thanks Jamie for reminding us of the importance of past godly influences in our lives…how to honor them, and what we can do to develop and grow from their teaching. Great post! Hi, good evening. My hero in faith is Charles Finney. I’m from Brazil, a little far away but I believe in God that one day I will visit his grave. I want your anointing. Thanks Jamie, God bless you !! !